Planning an adventure always smacks of excitement, a derring-do attitude and just a hint of spontaneity. 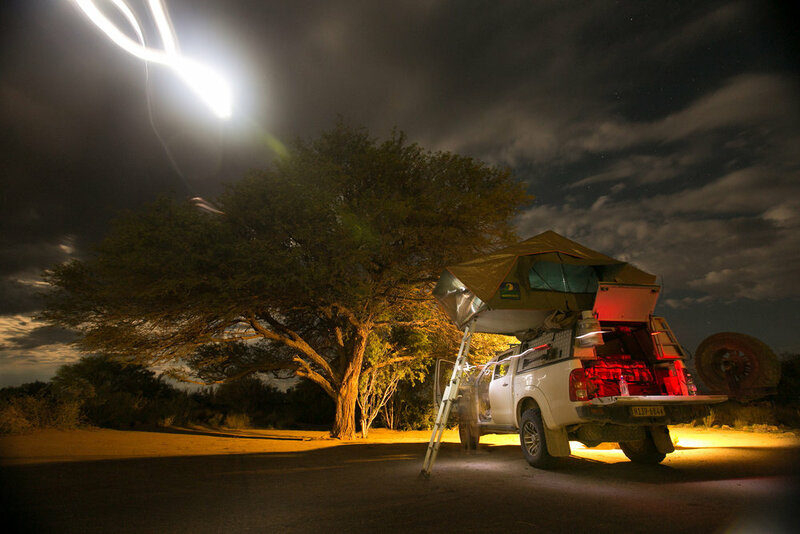 However, planning a trip into the inhospitable reaches of Namibia, puts one on the edge of one's seat. 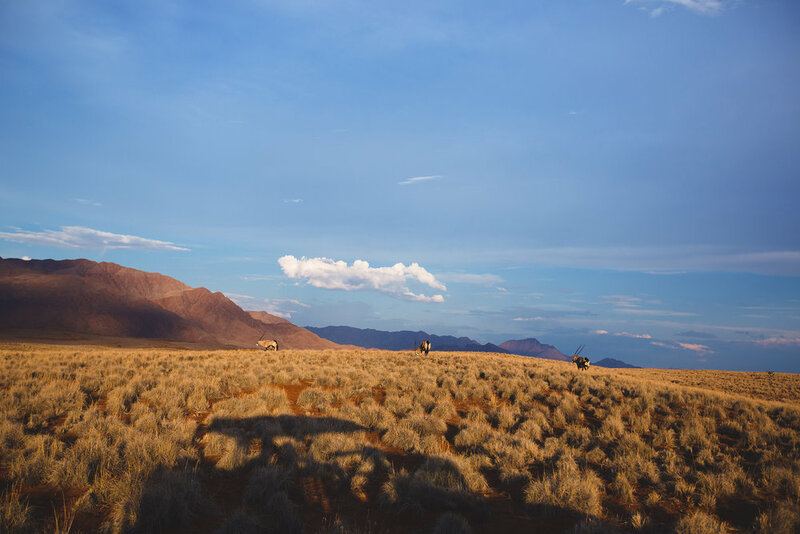 Matt and I had avoided dwelling upon the strong probability of getting deeply and irretrievably stuck in the fine, red sands of the Namib desert, that stretches for 81,000 km2, or of running out of water in probably the oldest and most deceptive deserts in the world. No, we would be prepared - super prepared! No skimping on equipment or quality of truck, we would even take along an extra Jerry can of fuel! 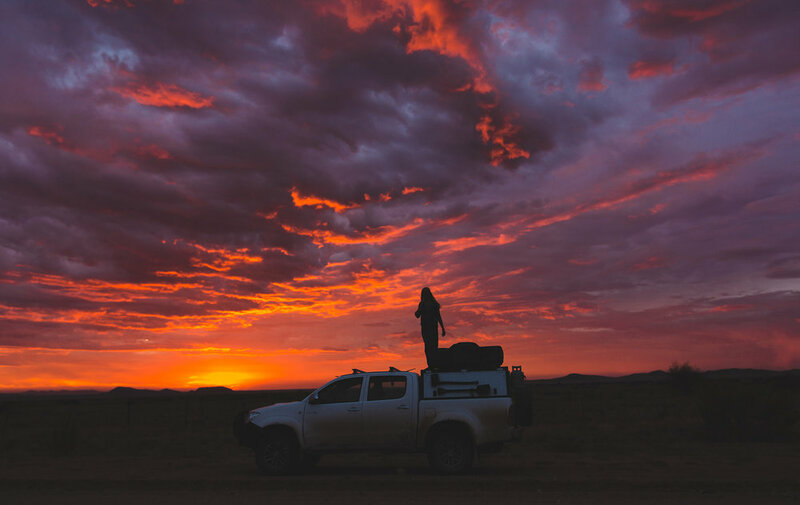 I honestly felt a sense of control and dare I say, pride as I confirmed our tickets to Cape Town and checked on the 4x4 Toyota Hilux that would be waiting for us - the newest and most reliable model. Driving into Namibia from the Cape, my first impression of this barren landscape was one of awe at the vast expanse of fascinating, varied features painted on the face of this vast desert; a sea of sand, forming waves of inspiring heights, some over 300 meters, dropping into canyons that shelter their own mini eco-systems. This was true beauty in all its untouched purity. When had the sky ever been so blue or the sands so blindingly golden? There are no filters in this landscape - no sensual or emotional restraint. Nothing to shield us from reality. We were face-to-face with early creation. The rutted 'roads' had the predictable effect on my jaw, joints and spine; I soon adopted the required grab-the-dashboard pose. No amount of high-tech suspension could spare me from the tooth-rattling dirt roads that in our wake, cast a veil of the finest, dusty powder over the landscape. Endless tracks sought the ever moving horizon, forming its own mirages as it snaked before us. The world was an endless place. I loved the feeling of being 'lost' in this wilderness. 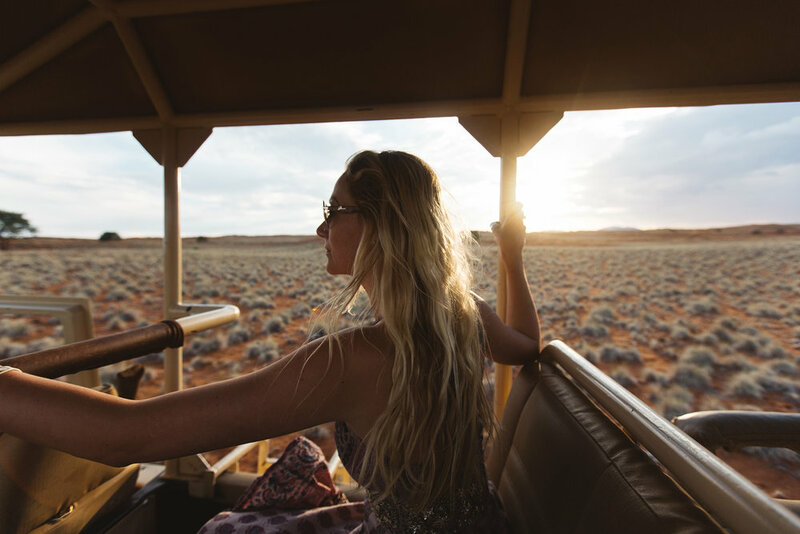 All sense of control and structure of my world had been abandoned; my whole being was drawn into the Namib and its mesmerizing mysteries. Nothing was as it seemed in this most ancient of deserts. The shimmering sizzling sand is home to a myriad of species of arthropods, animals and plants that have adapted to survive on very little water. Unexpected waterholes host small herds of elephants, zebras and giraffes. We watched harmonious turn-taking in the absence of any predators. I was struck by the intricate yet simple patterns that are iconic of Africa; the zigzag stripes of the zebra, the shattered puzzle pieces of the giraffes, the tears of the cheetah. Driving more slowly through the heat of the day, we faced the blazing afternoon, knowing that our only chance of catching glimpses of animals would be to scan the cooling shade under the sparse thorn trees. 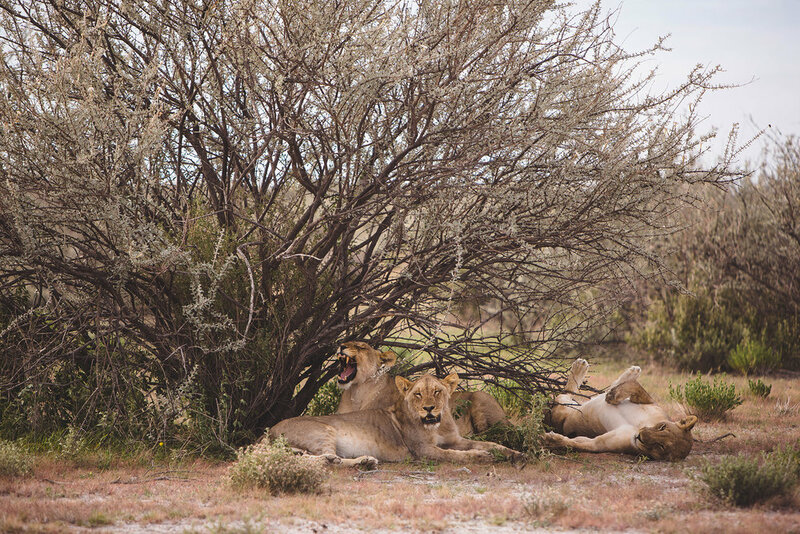 Three languid lionesses were our reward on this occasion, unperturbed and unthreatened by our proximity to them. A herd of elephants, passing silently behind some trees, caught Matt's sharp eye. Elephants have always been one of my favourite wild animals. I love the fact that they form a matriarchal society and that they travel the same routes, carved out by their ancestors. Their babies are guarded and disciplined, nudged into obedience at waterholes and taught the ways of the wild by caring, persuasive female family members. Unsurprisingly, this area is very sparsely populated, except by small communities of Himba people. My first glimpse of a Himba woman stopped me in my tracks. How does a western mind process the naked beauty of women covered in a deep ochre colour with copper coils, leather head dresses and beads for adornment? 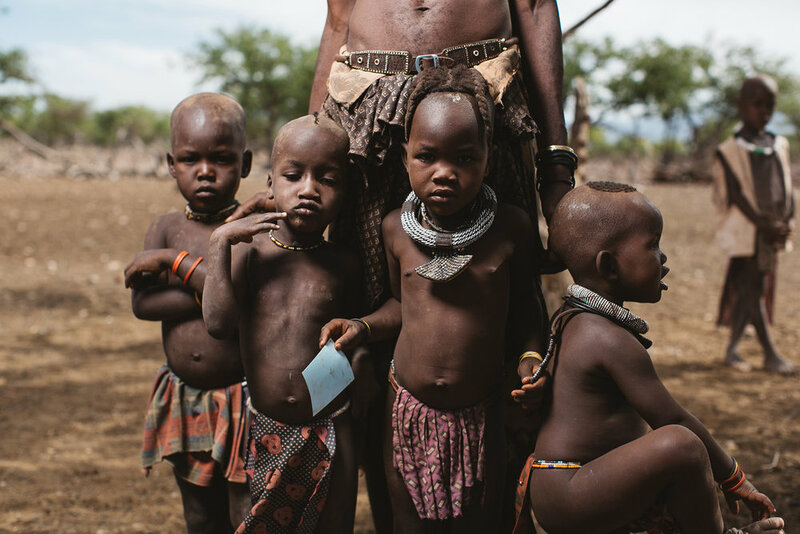 Here was a community that shared every moment of their subsistence lives; child care, cooking, foraging for food, fetching water and telling stories. Old tales are passed on while sitting around the smoky fires that never die out. These are people that are spiritual to their very core. The intricacies of weather, shifting sands and animal migration affect their day to day living and survival - they are connected to the earth in a way I had never conceived, thankful for every day of survival. I think it was the candid stares from the adults and children that caught us off guard. We were in their living space, witnessing their culture that stretches back thousands of years. Their inquisitive eyes and regal stature told us of the suspicion they felt in our presence, bred from their isolation and blissful ignorance of western ways. The old man, Africa-old, born in the year of 'the good rains', upright in stature and protective of his family, stood apart, so comfortable and at peace. He regarded us with curiosity and a hint of confusion. What would bring these strange people to their rustic community? I longed to communicate my admiration of them and how privileged they were to have been spared contact with the world we had come from. I treasured every moment I spent with these fascinating, earthy people. The threat of goats overgrazing is a disturbing reality in this area. 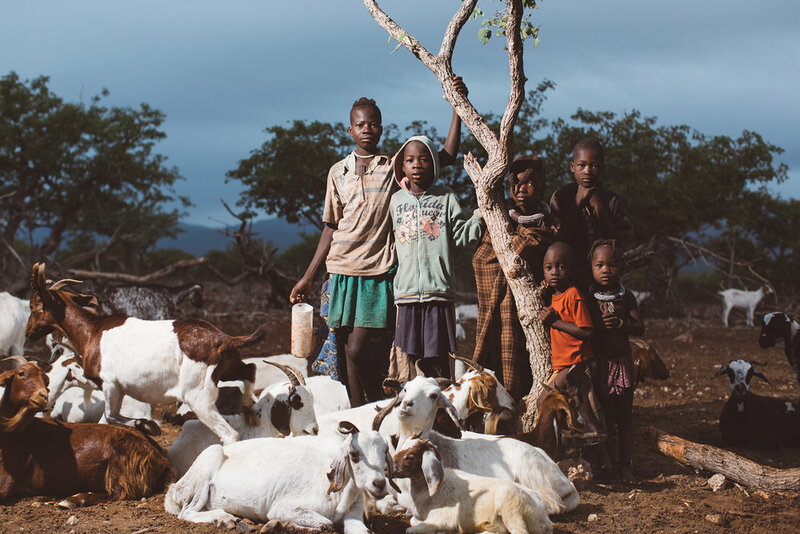 Pastoral herds are destroying the environment, yet the hardy goats offer a constant, invaluable source of milk and meat to the Himba. For them, the immediate need to survive far outweighs the long term consequences on the environment. We met some young, unkempt herders who stood protectively close to their comparatively well-fed, glossy haired goats. In contrast to the traditional Himba commune, these children appeared to have been given access to a discarded sack of western clothes, which they had chosen at random. 'Florida Queen' emblazoned on a grubby tracksuit top, sat uncomfortably next to a traditionally attired child. However, nothing prepared me for the little girl who strolled up wearing a jumper, ingrained with dirt, the sleeves hanging past her hands bearing a pattern of the British flag - totally incongruous. Again, that look in the children's eyes - distant, content, accepting. The eyes of Africa. Avoiding the touristy areas, led us into the heart of the land, resisting the regular return to luxurious rest camps. That said, we did weaken in favour of a hot shower, comfy bed and massive steak by stopping off at the unique Namutoni Camp, an old converted fort, that sits proudly in its environs, offering respite to all manner of travellers, yet retaining the outward reminder of its past connections with German history. I will never forget the sensation of that first cleansing shower, removing sand and grit that had caked itself comfortably and, I had feared, indelibly, into my hair and skin. A bed, clean sheets, cool water, a glass….trappings of my everyday living, yet appreciated and valued for the first time in my life. Back on the road and into the silence and intense heat, the vegetation was indeed, very scarce. Bones of old trees lay scattered and bleached in the sun; where once they had offered shade they were now ant colonies and beetle nests. 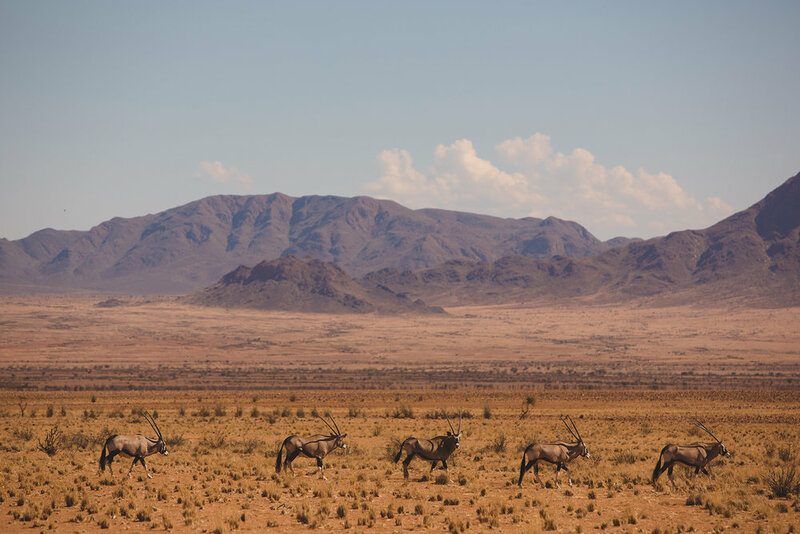 A lone, large gemsbok stood sentinel under a bedraggled acacia tree. We stopped, he stood, we stared, he stared back. Africa. Calm, self-contained and majestic! At one point, we stopped to climb a giant bronzed sand dune. The hot sand slipped unhelpfully from under our feet, as we clambered up and on to the crescent-shaped ridge, our steps leaving neat stitching on the hem of the sandy skirt. What met our eyes was breathtaking! Impregnable stretches of orange-yellow-golden dunes and valleys stretched before us in the deep silence of untouched beauty. A soft welcome breeze, offering some respite from the unrelenting, scorching heat, flicked sand grains against our ankles, reminding us of its constant presence. There never seemed to be enough water anywhere. In this parched stretch of desert, water is seen as a blessed gift from benevolent gods. So, when huge, brooding cumulonimbus clouds gathered and loomed over us, we rejoiced over the prospects of a shower for the inhabitants of the desert. The smell of heavy clouds and unreleased rain filled the air, and in the distance, on the other side of the mountains, the curtain of rain came down. Having teased us into the anticipation of its relief, we could only sit and watch its performance elsewhere. Fellow travellers were a rarity but we met up with a couple at an equally rare petrol pump and formed an instant bond. 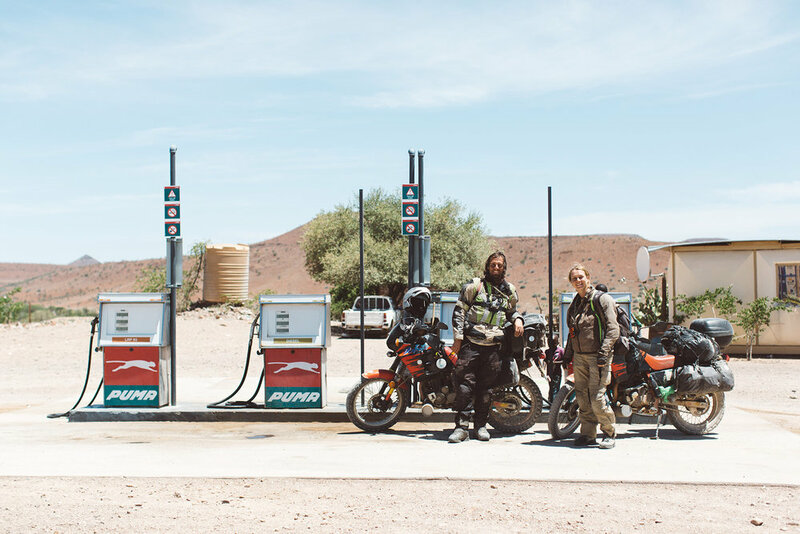 They had bravely ventured out on motorbikes, laden with what seemed an impossible number of weather-proof bags and back packs. An unspoken mutual respect was communicated in our smiles and handshakes, a fleeting but meaningful encounter. The name Skeleton Coast conjures up frightening images and so it should! This is one of the most lethal combinations of coast and interior that sailors ever encountered. Those that survived this stretch of ocean went on to face the dreaded Cape of Storms; a new respect was born for the predominantly Portuguese sailors of old. 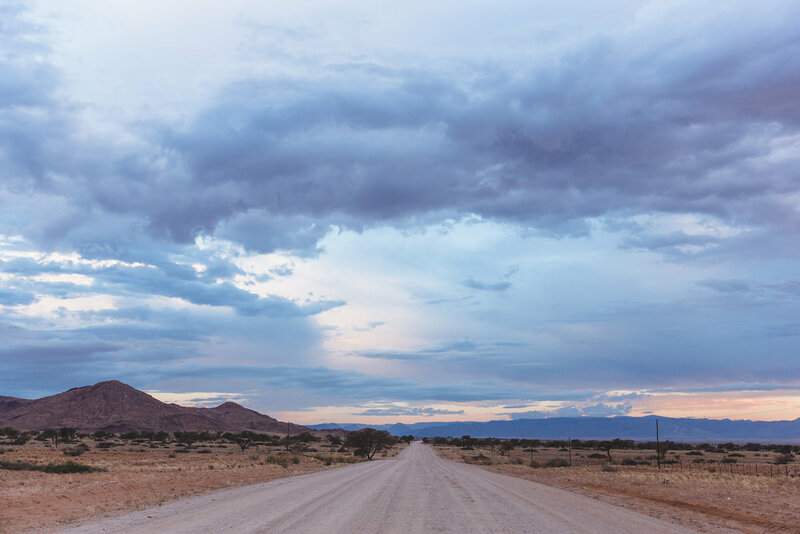 The Namibian San people refer to this stretch as 'the land God made in anger'. The Portuguese sailors called it 'the gates of hell'. We could only imagine the destruction that had taken place over the years. Access to this area is restricted to 800 people annually. We were privileged to be in this haunting and haunted place. One morning, we witnessed the deadly fog that creeps over the sea as the cold Benguela current fatally collides with the heat of the desert, creating confusion and an evil presence around any vessels that come into its territory. Hundreds of trawlers, cargo ships and tugs are then dragged inexorably over the hidden, sharp-toothed rocks lurking beneath them, to an inevitable death. 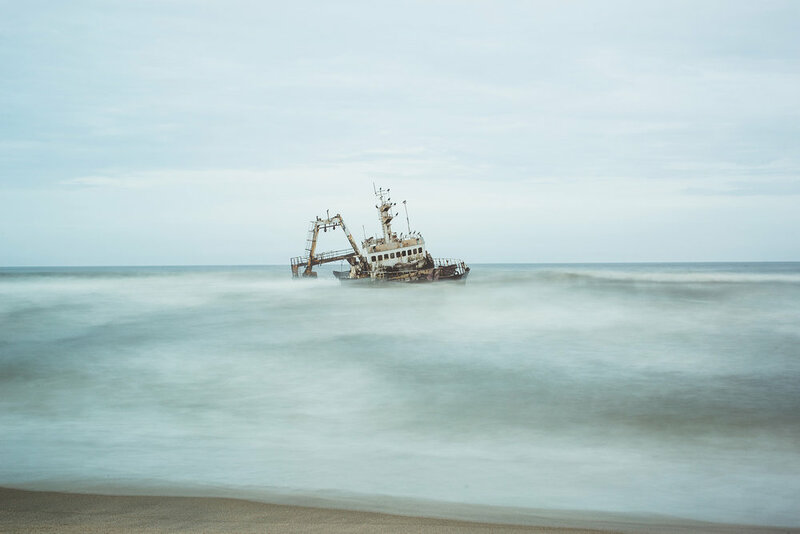 The image Matt captured of the rolling Suiderkus fishing trawler, wrecked in 1976 and now a home to seabirds, is a very clear reminder of the fate of so many other vessels. We rode in increasing silence over those last few kilometers, as the distance grew between us and the land that had captured our souls, the invisible presence that had brought us such serenity. We had rejoiced in its purity, honesty and resilience. Superficial concerns had been stripped away, layer by layer, leaving a raw sensitivity to every form of external stimulation. As our trusty 4x4 joined the first stretch of tarred road, we turned to each other, knowing that we needed to prepare ourselves for the onslaught of civilization and the inevitable shredding of our unencumbered joy. The horizon was broken into watery fragments as my heart ached and shrivelled, just a little. 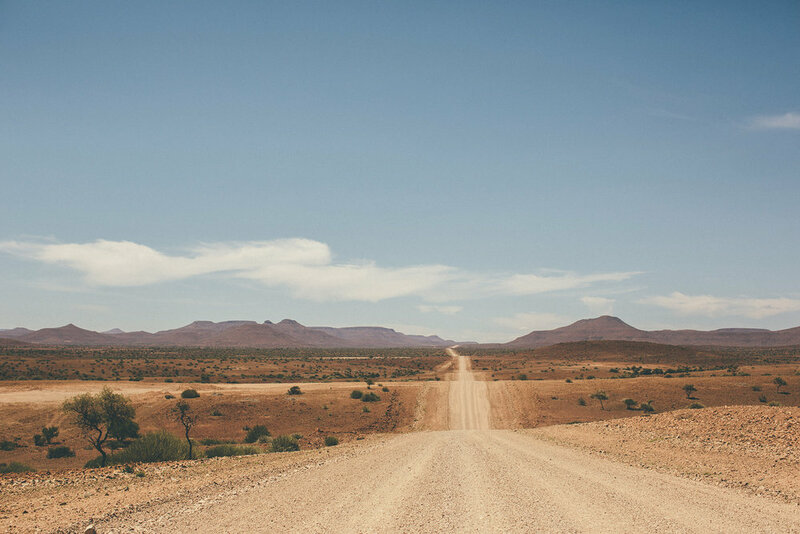 A personal journey through Namibia.